particle count efficiency test method or by Photometer point to point scan test with PAO / DOP challenge aerosol). 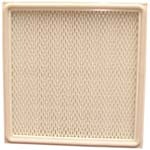 Filtration media is Micro glass fibre of "Lydall" or "H&V" makes. 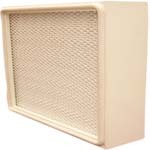 Manufactured in standard as well as customer specific sizes. Available in both Deep pleat type (conventional aluminium separator style) and Mini pleat type (with hot melt separators). Available in choice of depths of 100, 145 and 295 mm. 0.04mm thick safe edged aluminium corrugated separators. Epoxy or PU resin used as potting compounds to seal the media pack with casing. Silicone sealants used to seal all other leak sensitive points. Options of CCN / XLPE strips with dove tailed joints for gaskets for leak free filter fitment. Available in 3 variants of Low flow, Standard flow and High Flow to suit varying air handling requirements. Available in depths of 65, 75, and 90 mm. Hot melt separators at 1 inch spacing intervals throughout the width of the filtration media and running for the complete length of the filtration media. Extruded aluminium profiles used as casing for 65 and 75 mm depth mini pleat Hepa filters. Soft silicone, extruded, one piece, round edged gasket mechanically fixed inside casing groove and pasted for leak free filter fitment. 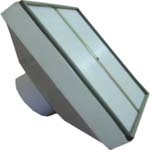 Available with supply hood and up-stream port suitable for use as a terminal filter directly connectable to a round or square duct. Metallic protective guard provided on both sides as a standard feature. Available in 2-V or 4-V formats with 600mm x 600mm face dimensions. 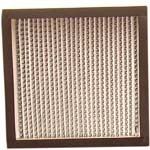 Each V - Bank Hepa filter comprises of multiple smaller sized mini pleat Hepa filters to enhance the air handling capacity. Useful in non unidirectional flow applications. Suitable for use up to 250 Deg C operations. Silicone sealants used to seal casing to media pack. Available only in deep pleat type. Gasket will be of silicone or of fibre glass media. 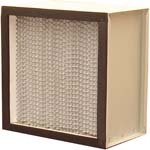 All other details of construction similar to Deep pleat Hepa filters.